Physical Therapy Career Options Offer a Niche For Every Passion and Personality...Find Out If Home Health Physical Therapy Is For You. Whatever your hearts calling, remember that the seasons of our lives give us various callings through the years... but a firm foundation begins with keeping yourself healthy and fit...for you can not give others that which you do not possess yourself. Physical Therapy is, well, more than your own fitness, it's about caring, hands on, movement potential, pain, sweat, consulting, evaluating, prevention, treatment, trouble shooting, encouraging clients, teamwork, intervention, friendships, heartaches, celebrations, tears, failure. It's about quality of life. It's physical, spiritual, emotional, physiological and social. Physical Therapy, one degree, many Physical Therapy career options, your choice - and you're not limited to one! You thought I'd forget? From this limited list, you can see that the sky IS the limit with physical therapy in your career search! There is so much you can do with this great career but it's all about home health care physical therapy here. Again, a great Physical therapy career option that you aren't stuck with! Get your feet wet! If you don't care for it, dry them off and jump in a different puddle! You'll find what fits your heart! The dawn of 2011 said Happy Birthday to the first of our 76 million baby boomers... 10,000 boomers will turn 65 every day for the next 19 years. Our site is dedicated to home health physical therapy and those who help our precious elderly companions. There are plenty of jobs to go around! If you are looking for a home health physical therapy job (or RN, OT etc!) just google it... the demand is even now is surpassing the supply of great quality home health care professionls! Discover your ability to help many become independent once again!. '...and if you choose to sit it out or dance, I hope you choose to (help someone) dance' because rehab is about dancing again! Independence means aging in place - at home where most want to be. 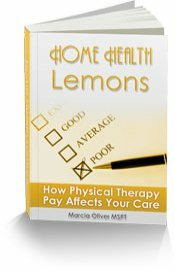 It also depends on quality home health physical therapy. We arm patients, caregivers and physical therapists with usable knowledge to dance again.